When lightning strikes sand a beautiful crystal, a fulgurite, is created. However, a lightning strike on the power grid is not as pleasant, as Google recently discovered. 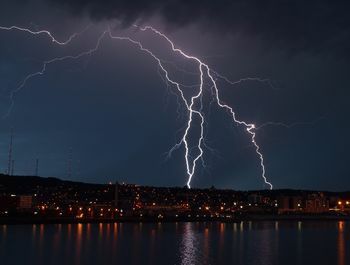 When lightning struck the local power grid supplying one of its data centres in Belgium - four times - several of the discs stored there were completely wiped. Here, Steve Hughes managing director of REO, takes a look at the top three ways power quality can affect your business’s electronic systems. These days you’d be hard pressed to find a business that doesn’t rely on electronic systems and electronic data and, while you may think you’ve got everything covered, if you’re not thinking about power quality you could be leaving your business vulnerable. Here are the top three power quality issues that could cause you problems. A power surge occurs when a system receives more electricity than it should for more than three nanoseconds. While there are several reasons this would happen, lightning strikes are the most common cause. At the extreme end of the spectrum, a power surge can wipe data from hard drives, as it did at Google’s data centre. However, there are more subtle problems a power surge can cause. For instance, frequent power surges can reduce the physical life span of your hard drive. Upon power loss the read/write head of the drive will jump back to its starting position. This abrupt motion can lead to the formation of minute imperfections that accumulate over time until they cause a head to crash, where the drive head scrapes the disc surface and destroys the hard drive. Compact power supplies in electronic devices and controlled motors are possible thanks to switch-mode power supplies (SMPS) in both personal usage and variable speed drives (VSDs) in commercial and industrial settings. This is achieved by manipulating the mains power supply using components in rectifier and chopper circuits in a process of high frequency switching or pulse width modulation (PWM). Although PWM achieves very low power losses, the process introduces harmonic currents into the power supply. Harmonics can lead to increased energy consumption and noticeable component damage. In addition, the electromagnetic interference (EMI) that is generated because of harmonics can begin to affect telecommunication equipment and metering apparatus. Internal SMPSs that draws a nonlinear current waveform can cause voltage distortion. While linear loads produce a sine wave current, SMPS draws current pulses at one portion of the applied voltage waveform, which increases with every device added to the system. The nonlinear current and impedance of circuit conductors and the power source creates a visible voltage drop, the greater the loading demands of a system the greater the voltage drop. A little distortion isn’t going to grind your business to a halt, but where the distortion is in high enough levels there is the risk of decreased efficiency of the power system. In addition, localised power distortion such as voltage ripples can be reintroduced into the mains supply. This is can be especially problematic in industrial settings where SCADA and DCS systems are in use over wide geographic areas. By working with an expert such as REO UK to put power quality measures in place you can mitigate the effects of these core threats. Although, to reach for a more beautiful solution, you should also take a leaf out of Google’s book and back everything up somewhere safe. After all, you may be able to petrify lightening by adding a little sand, but you can’t stop it from wreaking havoc on the power grid!